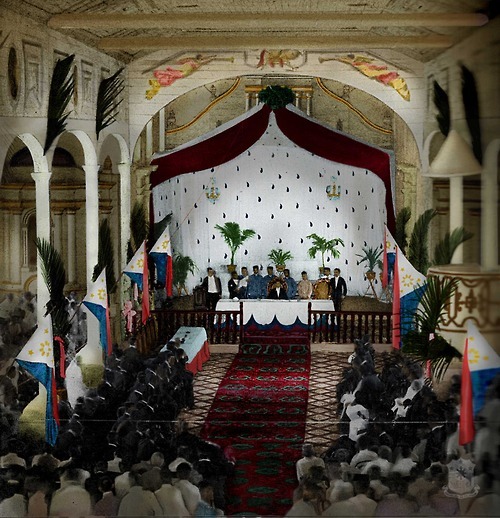 The iconic photograph of 1899 Malolos Congress: digitally colored, based on written accounts and the restoration of the Barasoian Church for the 1998 Centennial. President Aguinaldo sits at the center, as a gentleman reads a document to his left. The Philippines has had a total of six constitutions since the Proclamation of Independence on June 12, 1898. In 1899, the Malolos Constitution, the first Philippine Constitution—the first republican constitution in Asia—was drafted and adopted by the First Philippine Republic, which lasted from 1899 to 1901. During the American Occupation, the Philippines was governed by the laws of the United States of America. Organic Acts were passed by the United States Congress for the administration of the Government of the Philippine Islands. The first was the Philippine Organic Act of 1902, which provided for a Philippine Assembly composed of Filipino citizens. The second was the Philippine Autonomy Act of 1916, which included the first pledge of Philippine independence. 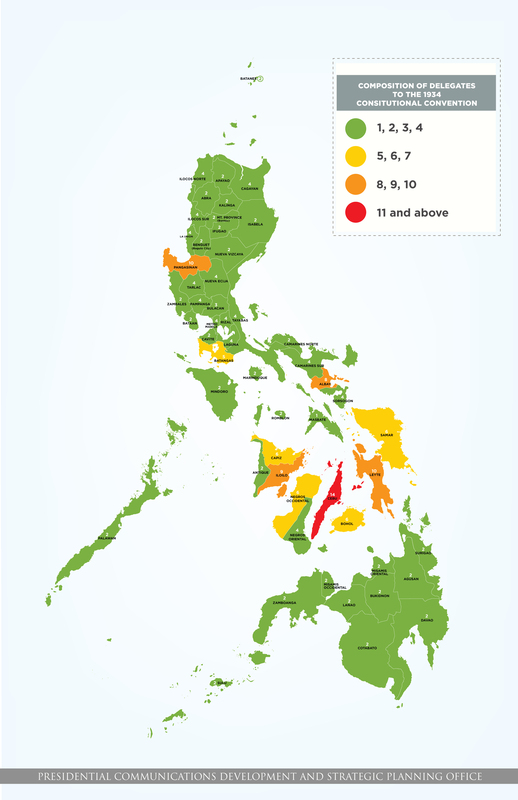 These laws served as constitutions of the Philippines from 1902 to 1935. In 1934, the United States Congress passed the Philippine Independence Act, which set the parameters for the creation of a constitution for the Philippines. The Act mandated the Philippine Legislature to call for an election of delegates to a Constitutional Convention to draft a Constitution for the Philippines. The 1934 Constitutional Convention finished its work on February 8, 1935. The Constitution was submitted to the President of the United States for certification on March 25, 1935. It was in accordance with the Philippine Independence Act of 1934. The 1935 Constitution was ratified by the Filipino people through a national plebiscite, on May 14, 1935 and came into full force and effect on November 15, 1935 with the inauguration of the Commonwealth of the Philippines. Among its provisions was that it would remain the constitution of the Republic of the Philippines once independence was granted on July 4, 1946. In 1940, the 1935 Constitution was amended by the National Assembly of the Philippines. The legislature was changed from a unicameral assembly to a bicameral congress. The amendment also changed the term limit of the President of the Philippines from six years with no reelection to four years with a possibility of being reelected for a second term. Philippine Executive Commission Chairman Jorge B. Vargas reads a message to the Kalibapi in the presence of Lt. Gen. Shigenori Kuroda and Speaker Benigno S. Aquino, in the old Senate Session Hall in the Legislative Building, Manila. This photograph was most probably taken on September 20, 1943, when the Kalibapi elected the members of the National Assembly from among its members. During World War II the Japanese-sponsored government nullified the 1935 Constitution and appointed Preparatory Committee on Philippine Independence to replace it. The 1943 Constitution was used by the Second Republic with Jose P. Laurel as President. Upon the liberation of the Philippines in 1945, the 1935 Constitution came back into effect. The Constitution remained unaltered until 1947 when the Philippine Congress called for its amendment through Commonwealth Act No. 733. On March 11, 1947 the Parity amendment gave United States citizens equal rights with Filipino citizens to develop natural resources in the country and operate public utilities. The Constitution, thereafter, remained the same until the declaration of martial law on September 23, 1972. Before President Marcos declared Martial Law, a Constitutional Convention was already in the process of deliberating on amending or revising the 1935 Constitution. They finished their work and submitted it to President Marcos on December 1, 1972. President Marcos submitted it for ratification in early January of 1973. Foreseeing that a direct ratification of the constitution was bound to fail, Marcos issued Presidential Decree No. 86, s. 1972, creating citizens assemblies to ratify the newly drafted constitution by means of a Viva Voce vote in place of secret ballots. Marcos announced that it had been ratified and in full force and effect on January 17, 1973. Although the 1973 Constitution had been “ratified” in this manner, opposition against it continued. Chief Justice Roberto V. Concepcion in his dissenting opinion in the case of Javellana v. Executive Secretary, exposed the fraud that happened during the citizen’s assembly ratification of the 1973 Constitution on January, 10 – 15, 1973. However, the final decision of this case was that the ratification of the 1973 Constitution was valid and was in force. 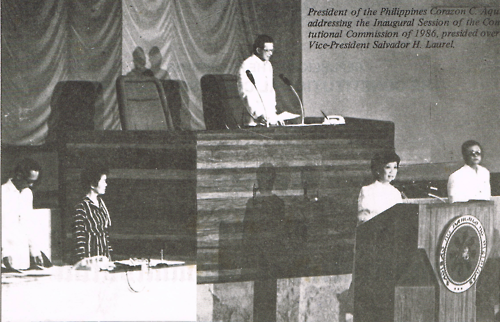 President Corazon C. Aquino addressing the 1986 Constitutional Commission at its inaugural session. When democracy was restored in 1986, President Corazon C. Aquino issued Proclamation No. 3, suspending certain provisions of the 1973 Constitution and promulgating in its stead a transitory constitution. A month later, President Aquino issued Proclamation No. 9, s. 1986, which created a Constitutional Commission tasked with writing a new charter to replace the 1973 Constitution. The commission finished its work at 12:28 a.m. of October 16, 1986. National Plebiscite was held on February 2, 1987, ratifying the new constitution. On February 11, 1987, by virtue of Proclamation No. 58, President Aquino announced the official canvassing of results and the ratification of the draft constitution. The 1987 Constitution finally came into full force and effect that same day with the President, other civilian officials, and members of the Armed Forces swearing allegiance to the new charter. 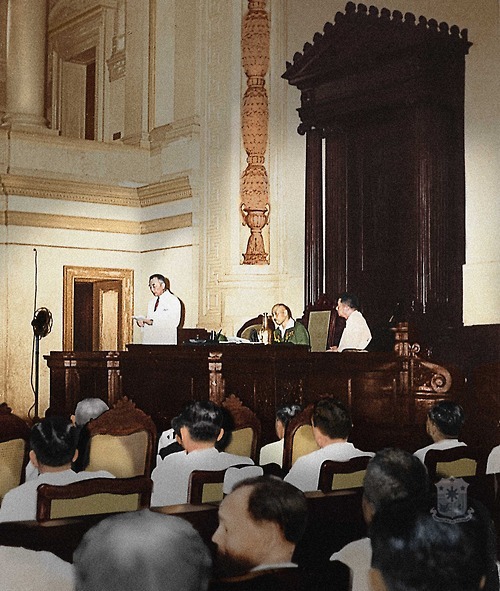 For every constitutional change the Philippines has experienced, a corresponding proclamation was issued in order to celebrate the date that each charter was put into full force and effect—with the exception the 1943 Constitution. 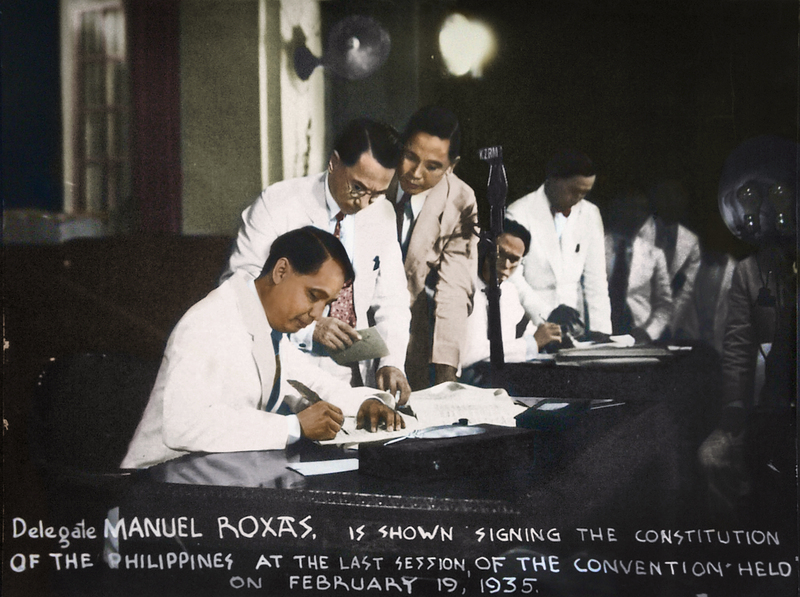 Delegate Manuel Roxas signs the Constitution. He was the leading member of the Committee on Style, also known as the Seven Wise Men, who had a significant impact on the final draft of the 1935 Constitution. President Emilio Aguinaldo issued the first proclamation that celebrated the effectiveness of a constitution in 1899 on January 23, 1899. In the Proclamation, President Aguinaldo ordered the release of Spanish prisoners under the custody of the Philippine revolutionary forces, to mark the inauguration of the First Philippine Republic. No subsequent proclamations were issued because of the outbreak of the Philippine-American War and the fall of the First Philippine Republic in 1901. Referendum Bandwagon: the Marcos era referendum was conducted by Viva Voce vote as opposed to the conventional Secret Balloting. In 1973, after the declaration of martial law, the 1935 Constitution was replaced by a new charter, the 1973 Constitution. In commemoration, President Marcos, repealed President Quezon’s Proclamation No. 36, s. 1936, by virtue of Proclamation No. 1219, s. 1973, which moved Constitution Day from February 8 to January 17 of every year. This proclamation commemorated the day when President Marcos certified that the new Constitution had been ratified. Constitution day was commemorated until the end of President Marcos term but was overshadowed by the Proclamation making September 21st of every year “Thanksgiving day”, the date indicated on Presidential Proclamation No. 1081, s. 1972: Martial law, however, was actually declared two days later when President Marcos announced it through nationwide television. When democracy was restored in 1986, the 1973 Constitution was replaced by first the freedom constitution, also known as Proclamation No. 3, s. 1986, then our current constitution, the 1987 Constitution. This constitution came into full force and effect on February 11, 1987, after President Corazon C. Aquino issued Proclamation No. 58, s. 1987. The proclamation issued by President Aquino included the results of the plebiscite held on February 2, 1987. After the ratification of the 1987 Constitution, President Aquino issued Proclamation No. 211 s, 1988, which moved the commemoration of Constitution Day from January 17 to February 2 of every year—a proclamation still in effect to this day. 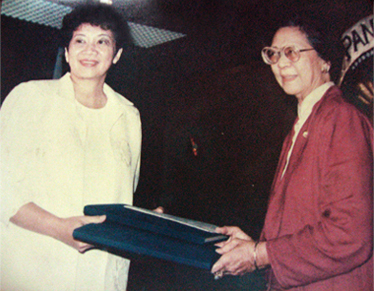 President Corazon C. Aquino receives the 1987 Constitution from Constitutional Commission President Cecilia Muñoz – Palma. Map of the composition of delegates to the 1934 Constitutional Convention. Map of the composition of delegates to the 1971 Constitutional Convention.